Medical billing and coding jobs from home offer a chance to build an out-of-the-cubicle career in healthcare. In fact, this remote-friendly career path is so in-demand that the Bureau of Labor and Statistics estimates it’ll grow much faster than average! Some estimates even suggest there are 50% more medical billing and coding jobs than there are professionals to fill them! A recent CNBC video highlights this labor gap of medical coders in a Where The Jobs Are report. Needless to say, with the right training under your belt, you can enter this wide-open professional field and secure steady employment. 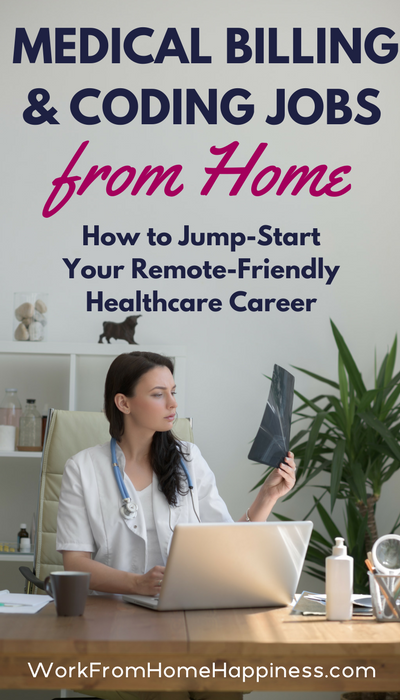 And, because many of the job responsibilities can be done using just a computer and Internet connection, there are a number of medical billing and coding jobs from home. Interested? Let’s look at this hugely in-demand remote career path and how you can get started (even if you have no experience). The healthcare industry as a whole is booming. If you’ve always been interested in a career in healthcare but can’t stand the sight of blood or didn’t want to go to school for years to get a degree and certification, medical coding may be right up your alley. You see, medical billing and coding specialists play an important role in the financial side of healthcare. They review patients’ records and assign codes to procedures and diagnoses. These codes are used by medical providers to bill insurance companies, patients, and government agencies (think Medicaid and Medicare). To keep things consistent, the entire industry uses three standard code sets. These are known as CPT, HCPCS, and ICD-10. The information you extract from records becomes a part of a patient’s medical history. So accuracy and confidentiality are key! Medical billing and coding jobs are known to pay pretty darn good. According to the Bureau of Labor and Statistics, the median pay in 2016 was $38,040 per year or about $18.29 per hour. Not too bad for a remote healthcare job that doesn’t require a degree! We know that medical billing and coding is an in-demand profession. But it’s not something you can just jump into. While you don’t need a degree, you will need post-secondary training. Once you complete training, it is often recommended to seek industry certification. (A good training program will prepare you for both your career and certification). As an entry-level medical billing and coding pro, there are two industry certifications to consider. The first is the Certified Professional Coder (CPC) offered by the American Academy of Professional Coders (AAPC). The other is Certified Coding Associate (CCA) offered by American Health Information Management Association (AHIMA). Although certification isn’t necessarily a prerequisite of employment, it can make you a desirable hire in the eyes of employers. But before you even think about gaining certification, you’ll need to go through training. Remember, a good program will set you up for success in your career and will prepare you to seek certification post-graduation. The Online Medical Billing and Coding Certification Training Program at CareerStep prepares students to work as a medical billing and coding specialist AND obtain certification after graduating. Did I mention you can do it all entirely online in as little as four months? It’s true. Full-time students can complete training in a few short months and be one step closer to securing employment. And because Career Step has developed relationships with employers over the years, many of their graduates have jobs immediately following graduation. There are even opportunities for remote employment! With Career Step, you’ll have the knowledge and skills to increase your earning potential as a medical billing and coding pro. To learn more about the many benefits of the training program and how you can enroll, visit the Career Step career and education training page. Many medical billing pros work for physicians, hospitals, clinics and other healthcare facilities. But there are a number of medical billing and coding jobs from home too. At Maxim Health Information Services, there are a variety of medical billing and coding jobs from home for you to choose from. In addition to working remotely, you are eligible for benefits that include 401(k), medical coverage, and flexible scheduling! MRA offers remote coding and cancer registry positions. Because they hope to retain long-term employees, MRA offers competitive pay, benefits, advancement opportunities, and continued education and training programs. Aviacode hires certified coders nationwide. Assignments range from psychiatry, inpatient, outpatient, and more. All of their medical billing and coding jobs from home are contract-based. This means that, while you won’t be benefits eligible, you will be afforded greater flexibility in how and when you work! For 35 years, LexiCode has provided remote coding support throughout the healthcare industry. They routinely advertise medical billing and coding jobs from home to meet their clients’ demand. Although there are a number of specialities to choose from, most of their openings involve hospital-based and physician-based coding. To date, there are coders located throughout 41 states at Precyse. As a remote coder here, you gain access to continuing education programs and ongoing support! There’s even chances to advance your career or learn a new skill that can lead to greater work opportunities. 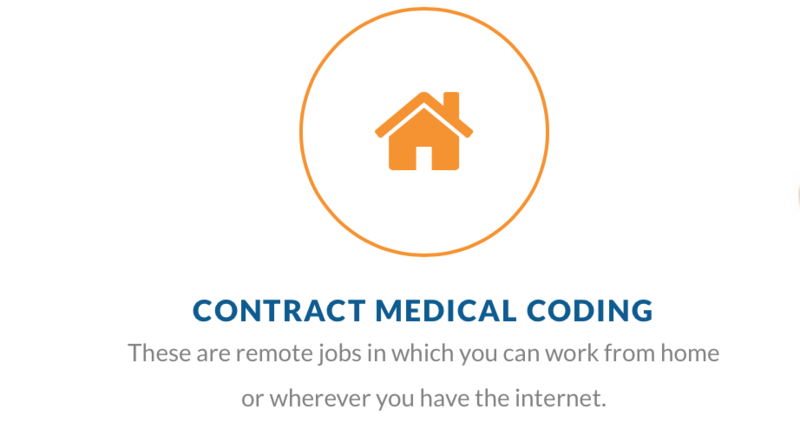 Above is just a short list of known companies that hire remote medical coders. This list should give you an idea of what’s out there but is by no means exhaustive! There are many more opportunities where those came from. Check out these 22 free websites, blogs and job boards for additional leads. Before jumping in to any new career path, be sure to do your research! You want it to be the right choice for you. The AAPC has an active forum with tons of great posts. Browse through the threads for valuable insight and information from current medical billing and coding pros. MTStars also has a coding-specific forum you can look through. There are discussions on everything from schooling to job opportunities! And of course, don’t forget about LinkedIn! Give your profile a makeover so you attract career-building connections. The post Medical Billing and Coding Jobs from Home appeared first on Work From Home Happiness.